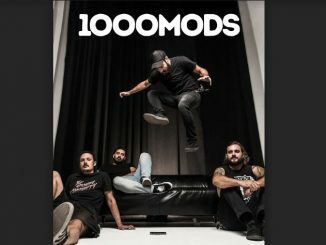 The James Dean of Heavy Metal is set to grace our shores in June 2019, nonetheless withALCATRAZZin tow! Renowned for his suave stage presence heading up the likes ofRAINBOW, ALCATRAZZ, MICHAEL SCHENKER GROUP, IMPELLITTERI and his solo bandGRAHAM BONNET BAND– not to mention his powerful, distinct and iconic vocal sound, that goes straight to 11 then swiftly into smooth melody in a heartbeat – GRAHAM BONNET delivers a solid stage trip through his career, that will not disappoint the discerning fan. With a career spanning a range of musical styles, and hit songs, it only makes sense to start with a mention to his first hit with the duoo,THE MARBLESin 1968, with the single“Only One Woman”.The hit song, written byBarry Gibb, Robin GibbandMaurice Gibbof theBee Gees, marks the impressive start to an awesome and diverse career. Embarking on the first leg of his solo career, Bonnet smashed the charts with a self-titled album that hit gold in Australia. 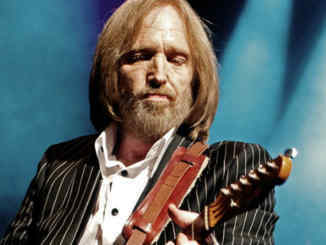 The album was met with great praise with hits including“It’s All Over Now, Baby Blue”,aBob Dylancover, which charted in the top five in Australia in 1977. Further to the success of this release, the single“Warm Ride”,Bonnet’s take on a leftover track from theSaturday Night Feversessionsand written by the Bee Gees, went to number one in Australia. Bonnet found his career taking a heavier Rock and Metal route when Ritchie Blackmore chose him to replace Ronnie James Dio on vocals for the band RAINBOW. 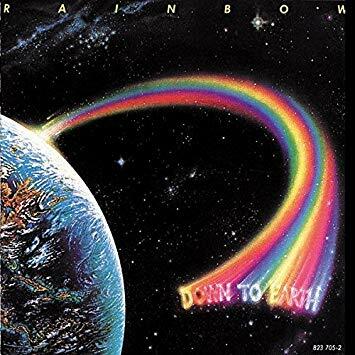 A hard act to follow, and a new genre to ignite, Bonnet proved his skill yet again, singing on RAINBOW’s iconic album ‘Down to Earth’, which became his most successful release to date with two hit singles“Since You’ve Been Gone” and“All Night Long”. Departing yet again from the beaten path, Bonnet co-founded ALCATRAZZ, with Gary Shea on bass, Jimmy Waldo on keyboards (both from the band New England), Jan Uvena (former drummer for Alice Cooper), and legendary, Swedish guitarist Yngwie Malmsteen. From 1983-87, the band released 3 highly revered studio albums (‘No Parole from Rock N’ Roll’, ‘Disturbing the Peace’, and ‘Dangerous Games’) and one live album‘Live Sentence’. In more recent years, Bonnet has toured consistently around the world with hisGRAHAM BONNET BAND, to throngs of fans. 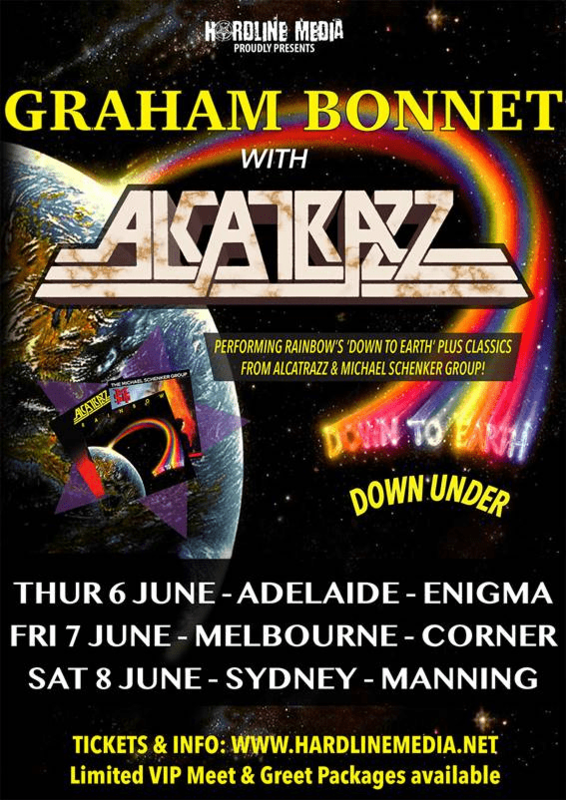 Now, for the first time in Australia, you will hear Graham and band perform the iconicRAINBOWalbum‘DOWN TO EARTH’in its entirety, as well as a slew of other hits from the melting pot of his career.